Home » Columns » Making Halloween Safe and Fun! Making Halloween Safe and Fun! Here in New England, the leaves and the temperatures are falling, a sure sign that Halloween is just around the corner. Halloween is celebrated by over 41 million people in America, and although children see it as an opportunity for unlimited sugar consumption, Halloween is historically a time of celebration and superstition. It is thought to have originated with the ancient Celtic festival of Samhain, when people would light bonfires and wear costumes to ward off roaming ghosts. Our modern Halloween beliefs and customs were brought to North America with the earliest Irish immigrants, and trick-or-treating quickly became the standard post-war practice for millions of children in America’s cities and newly built suburbs. No longer constrained by war-time sugar rationing, candy companies launched national advertising campaigns specifically aimed at Halloween. In Scotland and Ireland, young people would sing a song, recite a poem, tell a joke or perform another sort of “trick” before collecting their treat, which typically consisted of fruit, nuts or coins. In this country, we rarely ask our trick-or-treat visitors to perform a “trick for the treat,” and Halloween has become a community event that brings small children onto our streets and into our neighborhoods. It is important to keep ourselves and families aware and safe on Halloween. 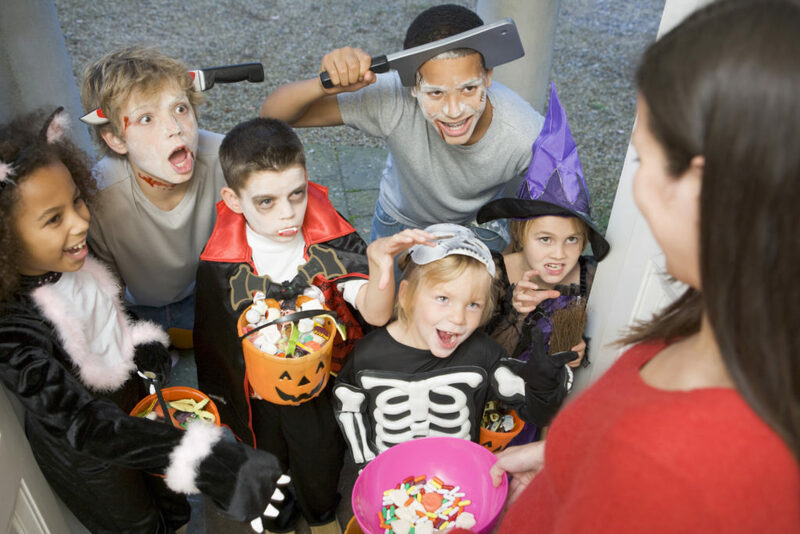 And with so many little ones on the search for candy – children’s safety should be a major concern during the night. Costumes that are bright and reflective make it easier for you and others to spot your children as they cross a street. A flashlight can help them navigate streets and sidewalks in the dark. Always make sure the fabrics are safe and non-flammable. Your child’s costume should fit securely, and shoes should be tied well. Avoid masks, as they can block views when it is dark and already hard for a child to navigate. Props like toy swords, guns or knives should be soft and flexible to reduce the risk of anyone getting injured. Always make sure your child is trick-or-treating in a group and with a responsible adult (you, another parent or a trusted individual). Stay on well-lit streets and roads; don’t use alleys or other shorter paths to help save time. Staying safe is much more important! As children get older, they would rather go out with their friends than their parents. If that’s OK with you, make sure you remind them of key safety points before they go out. When decorating for the holiday, make sure that all potentially flammable fabrics are away from lanterns, electric wires and extension cords. Also keep wires away from sidewalks where children will be walking. Keep any decoration high above where curious children can reach when decorating your porch or property. The loud sounds of Halloween can scare animals and make them aggressive, so it’s best to keep them away from the door when children knock! When done right, Halloween can be an enjoyable and exciting night for all. Remember these tricks to make this Halloween a treat for you and your loved ones!